Miriam worked in Zurich from 1990-1996 as a designer/illustrator in both full-time and freelance positions for advertising agencies such as Wirz BBDO and McCann Erickson. After that, she came to the United State to work for Disney on the new Disneyland Tokyo theme park designs. Miriam then went on to work with Cinesite/Kodak, the Hollywood special effects company, as staff illustrator/concept artist. Her feature film projects included Titanic, Hard Rain, The Truman Show, Face Off and Practical Magic. 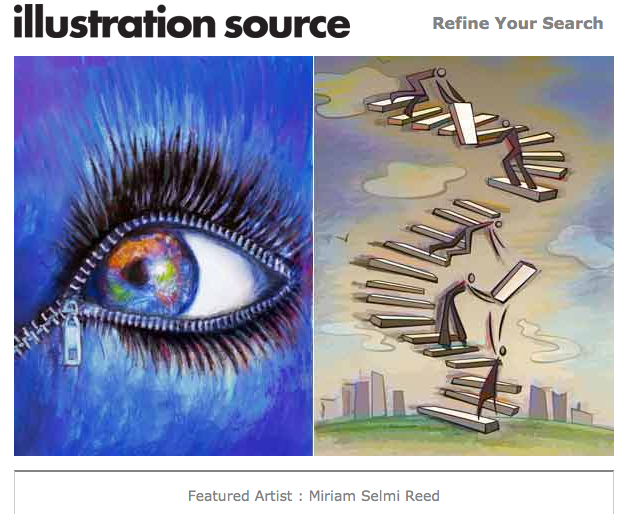 Illustration Source provides you with speed and convenience. Our website design and simple pricing allow you more time to work on your project and less time searching for images and decoding costs. The artists represented by Illustration Source are some of the best illustrators working today. Contact us today and start licensing the best conceptual illustration available. This entry was posted in Promotion and tagged artist, character design, Color, drawing, einfärben, illustration, kolorieren, painting. Bookmark the permalink. ← Black is not Black!